By Di Colavita, Psy. D.
Workforce planning is vital to any organization’s future, but the increased speed and continuous nature of organizational change puts additional pressure on organizations to accurately maintain workforce information. Ideally, workforce planning is integrated into all business objectives and forecasting, but this is an aspirational goal for many businesses. Today, change management is no longer an event but a continuous process that must be embedded in an organization’s DNA. As businesses continue to grapple with a world of volatility, uncertainty, complexity, and ambiguity (VUCA), new and ongoing challenges will continue to stretch the abilities of HR teams everywhere. Change management is a strategic priority for global organizations, but also a capability that is not well developed within the HR/OD function to deliver this expertise to the business. A critical priority for many is creating/delivering an HR service model that is easy to use, more agile, and integrated across the business. HR needs more proactive alignment and engagement with the business, focusing less on administration and more on helping business partners manage and adapt to change more easily. In one case, a large global beverage company has created a COE of Agility role that specifically focuses on all processes and expertise needed to manage organizational change, including the use of tiger teams. Continually shrinking HR/OD budgets; increasing demands from the business for support due to mergers and reorganizations and limited development of HR capabilities in change management were often cited as constraints or barriers for HR/OD. Against this backdrop, workforce planning and predictive analytics will be front and center for the foreseeable future. Workforce planning is a systematic organizational process that consists of proactive planning to avoid talent surpluses or shortages. Most medium- to large-size companies have plans and strategies in place with varying degrees of rigor and success. The challenge for most HR/OD teams and organizations is to have a plan and process that is continuous, agile, and embedded in the business strategy. Develop a workforce-agile culture throughout the organization, enabling leaders and employees to anticipate change and adapt to changes in the work environment. Being proactive with the needs of key stakeholders and customers is the pathway to success, but one that requires the company and its workforce to adapt, learn, and respond quickly to the ever-changing, connected, consumer-driven marketplace. Focus talent acquisition efforts on critical skills over specific experience or expertise – hiring and deploying talent based on their ability to adapt, learn, perform, and collaborate instead of a unique or narrow expertise. Ongoing needs for select expertise and experience will exist, but overall, the bulk of an organization’s talent should be adept learners/adaptors/collaborators whose abilities will contribute to an agile workforce. Delivering real-time learning and knowledge will be a key lever in fostering this agility. Integrate technology platforms and HRIS to deliver more real-time data that can be used in talent selection, performance, and development. HR/OD organizations may need to hire from within to maximize the power of data analytics in workforce planning for accurate and on-demand information for organizational change and strategic planning. Conduct regular reviews of the current and future states (scenario planning) of the marketplace, business, and changing talent landscape to be more proactive in preparing and planning for shifting workforce trends and patterns. This is especially important for global companies that will be managing the gig economy, multi-generational workforce, reskilling, and global gaps for talent. Adapting to workplace dynamics and trends will be critical, such as open and community workspaces, integrating gig talent, globally remote teams, ongoing digitalization of work processes, and AI’s growing impact on the workplace. Develop capabilities for HR/OD related to all things change management as opposed to administrative oversight, focusing on strategic priorities of the business, as well as shaping culture and employee experience. In a recent Human Capital Institute member survey, developing change management skills was identified as a top priority for HR professionals, with 80% saying their organizations are in a constant state of change. 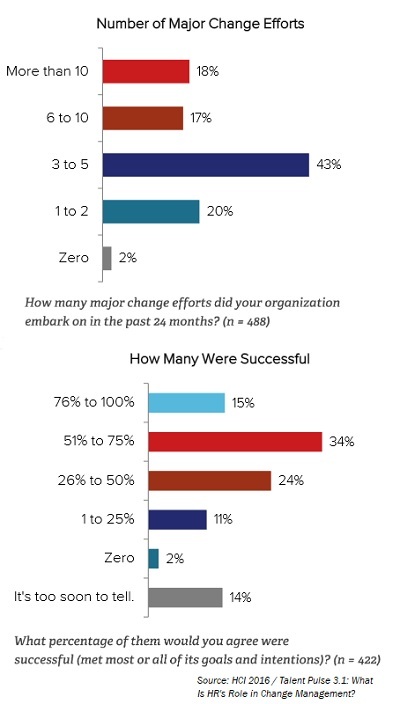 However, only 15% of HR professionals reported that their change efforts were mostly or entirely successful, suggesting continued gaps between HR abilities and organizational demands. Increasingly, businesses and their HR teams will have to become experts in change together to ultimately shape a more agile workforce and culture and to thrive in the VUCA environment. This article was originally published on TLNT.com.